Praying for what? Religious Extremism was evident even among the disciples who argued about supremacy. Fr. Vazken talks about the terrorist attacks in Paris and our response as Christians. Why pray? Finding our response to evil in the tolerance language of the Gospels. A very moving surprise story included from the outreach ministry at a local shelter. Delivered by Fr. 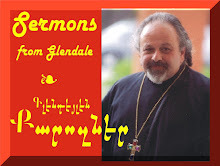 Vazken Movsesian and Recorded LIVE on November 15, 2015 at the St. Peter Armenian Church in Glendale.